I get a lot of recommendations for places to try mac and cheese, and usually, these are the places I end up wanting to try and write about. Every now and then, however, I'll happen to find myself surprised by a restaurant's menu. I'll see mac and cheese and just HAVE to try it. That happened just recently while eating lunch with a friend in Tiburon. We went to Tiburon Tavern, located inside the Lodge at Tiburon. I've always wanted to try this restaurant, simply because their outside patio looks so cool and comfortable. Due to some unseasonal drizzle, however, we found ourselves dining inside at one of their booths. I was happy to find that the interior seating was just as inviting. We looked over the menu and there were several items I wanted to try, but then my eyes glanced to the edge of the menu, toward the listed "side" options. 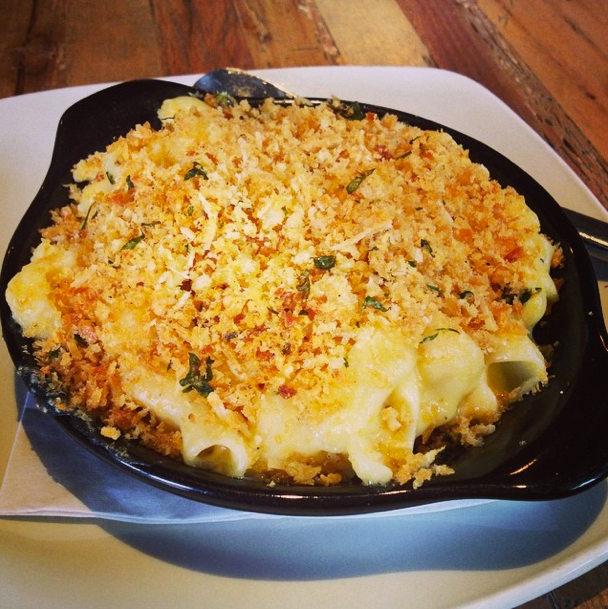 There it was, Macaroni and Cheese with "herb bread crumbs". As if I haven't already had enough mac and cheese lately, I ordered it. It was just one of those days where I just HAD to try it. Sometimes when you order a "side" item, it ends up being huge, so I was actually a little worried about this being too much food for a "light" lunch. Who was I kidding? I had given up "light" the moment I said "macaroni". I was pleasantly surprised when our dishes were presented and the mac was served in a dish just perfect for a lunch time bite. Instead of being some huge platter, it was the size you would expect in a small cereal bowl. It was still filling, however. I left very satisfied and wasn't hungry again for several hours. The cheese was okay. I couldn't quite put my finger on it, but it had an unfortunate, thick Velveeta feel to it. If that's what you have a craving for, however, it's great! I think it's pretty hard to go wrong with mac and cheese. No matter what the flavors are, it's still cheese. Yum. It did have a really good, creamy texture. It also had the most unique noodles I'd ever seen. Perhaps they were slightly over cooked and just falling apart, but they looked like some odd version of a corkscrew. And the bread crumbs, while not anything to write home about, were piled on top with abandon, which I always appreciate. If you ever find yourself at Tiburon Tavern and looking for a small side to share, get yourself a spot on the outdoor patio and an order of the mac and cheese. It's not the best I've had, but I wasn't disappointed.